Over the past year, Anadarko's stock is up over 30%, and Exxon's is break-even at best. Exxon is still the better buy for conservative investors. International energy giant ExxonMobil Corporation (NYSE:XOM) hasn't been a particularly rewarding investment over the past year or so. In fact, the stock has basically treaded water for the past 12 months. Before you jump ship and buy an oil stock like Anadarko Petroleum Corporation (NYSE:APC), which is up about 30% over the same span, you need to step back and understand the implications of these companies' business models. Indeed, while Anadarko is killing it right now, Exxon is still the better long-term buy for more conservative investors. Although Anadarko Petroleum owns a midstream business, it predominantly operates in the upstream sector as an oil and natural gas driller. Oil sales alone made up around 70% of revenue in the second quarter. It is a big player in the U.S. onshore market, though it has exposure to a number of foreign markets, including Mexico and Africa. There's no question that Anadarko has been firing on all cylinders lately. Revenue grew 30% between 2016 and 2017, with year-over-year revenue increases in the first and second quarters suggesting that another top-line advance in 2018 is highly likely. Moreover, after a string of red ink, the oil driller was in the black in the first half of the year. And it expects to grow its oil production by 13% this year. If you believe oil prices are going to head higher, or at least not fall into another deep downturn, then Anadarko is a pretty interesting stock. However, long-term debt makes up around 50% of the company's capital structure. Add in the debt of its controlled limited partnerships, which it breaks out separately on its balance sheet, and that number goes up to nearly 60%. That's a lot of debt for a company whose top line is highly dependent on a volatile commodity -- and one for which capital spending is a huge recurring cost, with the company planning to invest roughly $4 billion on the drilling side this year alone. In fact, through the first six months of the year, Anadarko has spent more cash on capital expenditures than it generated from its operations. 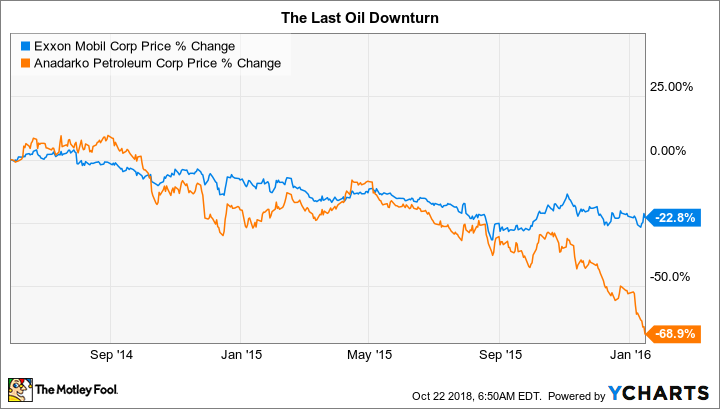 If oil prices were to fall like they did in mid-2014, which wouldn't be an unusual event in the energy space, Anadarko could quickly find itself forced to pull back on its capital plans, with its bottom line likely falling back into the red. It could also end up cutting its dividend again, like it did in 2016 (a painful 80%). It's in that exact environment that a diversified and conservative company like Exxon shines. For example, Exxon managed to remain profitable throughout the last oil downturn, using its rock-solid balance sheet to support capital spending and steadily grow its dividend. In fact, with 36 years of annual dividend increases, it boasts a dividend record none of its peers can match. Anadarko didn't hold up nearly as well through that period, and its disparate stock price performance highlights the difference -- Exxon fell around 23%, while Anadarko lost more than two-thirds of its value. There are two big differences you need to focus on, here. First, Exxon's business is broadly diversified across the energy value chain. Upstream is its biggest business, but it also has sizable chemicals and refining operations. Downstream assets like these tend to benefit from falling oil prices, since oil is a key input. That won't offset all of the pain if oil declines steeply, but it will provide a meaningful counterbalance. A real-life example might help. In 2015, when oil prices were still in a steep decline, Exxon's upstream business saw earnings fall about 75%. However, downstream earnings more than doubled. The end result was a roughly 50% decline in overall earnings. Not great, but much better than what would have happened if Exxon didn't have a diversified portfolio. Exxon's balance sheet, meanwhile, provides another safety valve. The company's debt load more than doubled during the oil downturn that started in mid-2014. That said, long-term debt peaked at around 15% of the capital structure. And it's down to around 10% today, as Exxon's conservative management team has been focused on debt reduction -- essentially preparing the balance sheet for the next oil downturn. There's little question that Exxon can keep spending on its future, and returning value to investors via dividends, if oil prices fall again. So, why has Exxon been such a lackluster investment? The answer is that production has been weak, and returns on capital employed have fallen from leading the pack to just middle of the road. It's been tough to stay positive about the company, which simply hasn't been able to fully benefit from the current oil upturn, the same one that has helped Anadarko thrive. Exxon is aware of the problems it faces and has plans to right the ship, but it's taking a long-term, conservative approach (just like it always does), favoring profitable investments over quick, short-term fixes. This is why long-term investors should be particularly interested in Exxon today. Its yield, at around 4%, is historically high, and its price to tangible book value is historically low. And, when oil prices decline again, it will be on financially solid ground to deal with the headwind without skipping a beat. There are good reasons Anadarko's stock has outperformed Exxon's over the past year, and it will likely continue to do so while oil prices are strong. However, when you look at a highly cyclical industry like oil drilling, you should examine the full cycle and not just the most recent upturn. When you pull back and look at how well these two companies performed during the last downturn and how well their balance sheets are prepared for future oil price turbulence, Exxon looks like the more desirable investment. That's particularly true for income investors and those with a conservative bent.